How would the Senate health bill affect U.S. workers employed at or near part-time? The Senate health bill contains requirements for employers to provide coverage for full-time employees or pay a penalty based on the number of full-time employees in the firm. The current language of the bill defines full-time employees as those working more than 30 hours per week. This data brief looks at which industries have a high percentage of employees who either work fewer than 30 hours or whose hours are slightly above that amount, which may place them at risk for reduced hours by an employer wishing to avoid penalties. We then look at the distribution of hours worked by type of health coverage to understand how differs between part and full-time workers. 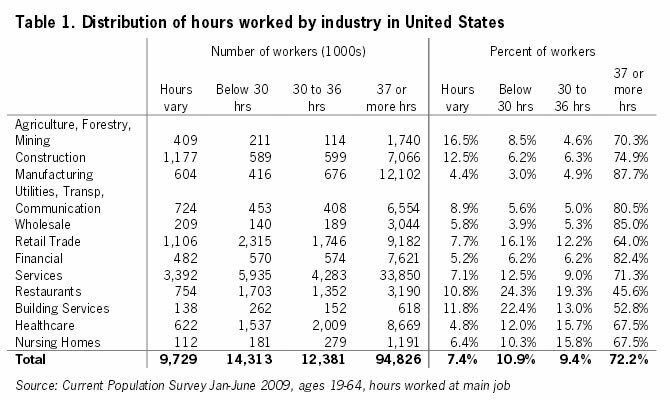 Table 1 below shows the distribution of hours worked by industry in the United States. From this we see that 95 million U.S. workers work 37 or more hours and would be considered full-time. Twelve million work 30 to 36 hours and may be at risk of reduced hours, while 14 million work fewer than 30 hours at their main job and would be considered part-time. Nearly 10 million workers report that their “work hours vary” and this group would likely be defined as part-time. Altogether, this means that while 72.2 percent of workers hold full-time jobs, the remaining 27.8 percent work part-time or may be at risk of having hours reduced by an employer wishing to avoid paying penalties. The industries with the highest percentage of part-time workers or workers at risk of reduced hours are Restaurants, Building Services and Retail Trade. The industries with the greatest number of part-time workers are Services, Healthcare and Retail Trade. Table 2 shows the distribution of worker health coverage by the number of hours typically worked. While 60.3 percent of U.S. workers have employer-sponsored insurance through their employer, this only holds for 18.5 percent of employees working fewer than 30 hours a week. For this part-time group, 36.5 percent have insurance through a family member, 10.3 percent have public coverage, 11.7 percent purchase coverage through the individual market and 23.0 percent are uninsured. Slightly more than 60 percent of those working between 30 and 36 hours do not have coverage through their own employer.